You don't have to live in Canada, the United States or Italy to help Cristina. If you live in a country with a cooperative registry your stem cells or bone marrow can be flown to Canada to save Cristina. 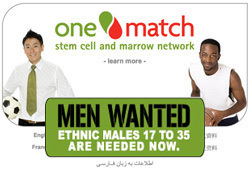 "The National Marrow Donor Program® (NMDP), which operates Be The Match®, has formal business relationships with donor registries in other countries. These donor registries are called NMDP cooperative registries. When a doctor searches our Be The Match Registry® on behalf of a patient, we can search millions of additional volunteer donors through our cooperative agreements. And patients in other countries can access the volunteers listed on our registry. These cooperative agreements play a significant role in helping patients find matching donors. Fifty-one percent of the transplants we facilitate involve either a U.S. patient receiving cells from an international donor or an international patient receiving cells from a U.S. donor." 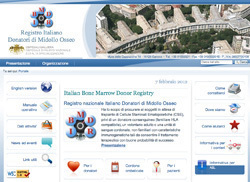 Join Italy's Italian Bone Marrow Donor Registry. Click here for more registries worldwide. Ask others to join their local registries by word of mouth, email, Facebook, Twitter, Pinterest or blogging. Like Cristina's Facebook Page for updates. Print Cristina's flyers and hang them where you work, shop, etc. 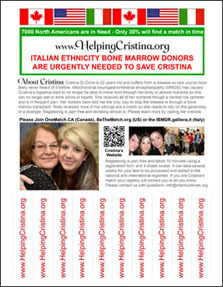 Click Here to learn how to join the registry or help spread the word to help Cristina. Registering is pain free, done with a cotton swab. 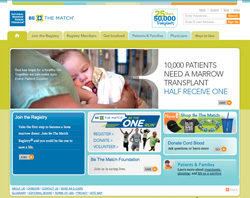 Join www.BeTheMatch.com and/or Host a drive in the US to help Cristina and the other 6000 US patients in need.